Remember the original Magic Ball? 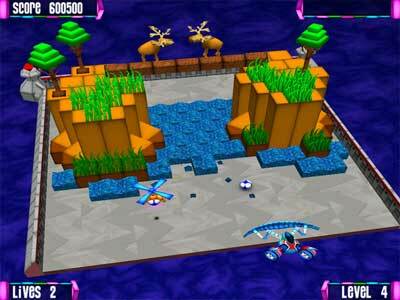 The one that got over 5 million downloads and Net’s best 3D Arkanoid remake title ? The good news is that the sequel Magic Ball 2 has just been released. The very good news is that there are 100 brand new levels ! Magic Ball 2 begins with a simple idea : Give the player a ball, a paddle and a pile of bricks to smash, and set him loose. What the creators of the game did with that concept launched a brick-busting craze that continues today ! Magic Ball 2 is an out-and-out assault on the senses. The three-dimensional levels seem to pop out of your screen, immersing you in the action as a giant T-Rex rampages through a bustling metropolis or a fire crew extinguishes a towering inferno. As you obliterate these scenes, power-ups rain down from above, allowing you to launch missiles, rack up points, put multiple balls into play and more ! As if that wasn’t enough, Magic Ball 2 ups the ante with explosive bricks, fireballs, teleporters and more insanely fun ideas than one game should be allowed to contain. Best of all, Magic Ball 2 is as easy to play as the original Breakout, making it a favorite of casual gamers worldwide.